For all bolts and screws except countersunk screws, the length is measured from under the head. For countersunk bolts and screws, the length is the overall length (OAL). Clevis Pins: Measure length from beneath the head. This will be the length of the clevis pin as reflected in the Item Number. For instance, CLP124 is a clevis pin, 1/2" diameter, 4" long (measured from beneath the head). The effective or usable length of the clevis pin is measured from beneath the head to the top of the hole. 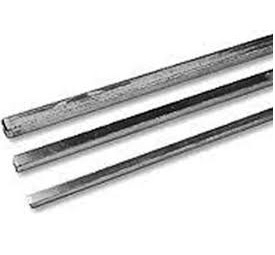 Cotter Pins: Measure length from beneath the head. Flat Head Bolts: Flat head bolts (also called countersunk bolts), are measured on the overall length of the bolt. Hex Head Bolts: Hex head bolts are measured from under the head to the end of the shank. Safety Pins: Order using the diameter and overall length (OAL) and industry #. May be beneficial to call our Help Desk during normal business hours. Socket Shoulder Screws: Order by the diameter and length of the shaft. The thread size defaults automatically to the next smallest diameter. U-Bolts: Order using the pipe size the u-bolt will be used to hold. May be beneficial to call our Help Desk during normal business hours. * Prices shown are per each piece, not per package. Please order by the number of pieces you wish to order, not the number of packages. You may order less than full package quantities but any broken packages will result in a 20% handling charge for that package subject to a $3.00 maximum charge. The Bolts 'n Nuts Plus web site is now mobile friendly. Save More Money off our everyday Low Prices! Prices shown are in U.S. Dollars. Image is representative of product, but may vary from actual item.